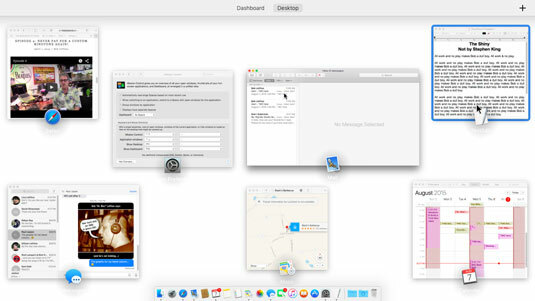 Mission Control in OS X El Capitan shows you thumbnails of all open windows and full-screen apps in a unified view. 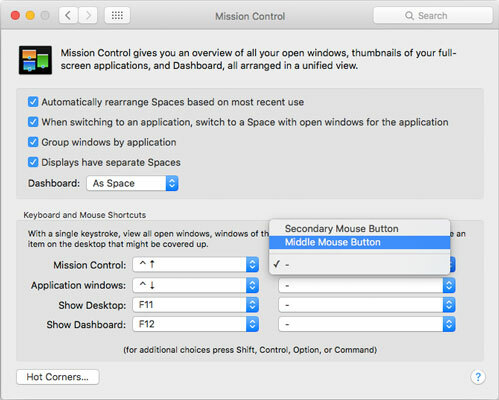 Before you see how it works, look at the Mission Control System Preferences pane, where you turn specific Mission Control features on and off and assign keyboard or mouse shortcuts to them. The Mission Control System Preferences pane. The top part of the pane contains four check boxes: Automatically Rearrange Spaces Based on Most Recent Use; When Switching to an Application, Switch to a Space with Open Windows for the Application; Group Windows By Application; and Displays Have Separate Spaces. Experiment with the settings, turning them on and off, to see which way you prefer them. You can choose to display Dashboard as an overlay (the default) or as a Space (which you’ll understand shortly). You can also choose Off if you never want to see Dashboard. Moving right along, most of this pane handles keyboard and mouse shortcuts for Mission Control. The eight pop-up menus — four each for keyboard and mouse shortcuts — let you specify the trigger for each of the four Mission Control features with a keystroke or mouse button. The default keyboard shortcuts appear in upcoming text, but yours may differ; to change them, click the appropriate pop-up menu and make a new selection. Hold down the Command, Option, Control, and/or Shift keys when you choose an item from any of the eight shortcut menus to add modifier keys to the shortcuts you create. So, for example, if you were to hold down Command+Shift when you select F11 from a pop-up menu, the keyboard shortcut for that feature would be Command+Shift+F11. Or, if you were to hold down Shift when you select Middle Mouse Button from a pop-up menu, you’d have to hold down Shift and click the middle mouse button to invoke the command. Finally, most Apple keyboards made since April 2007 also include dedicated Mission Control and Dashboard shortcut keys (F3 and F4, respectively). If you see a tiny picture that looks like the Mission Control icon (shown here) on your F3 key or that looks like the Dashboard icon on your F4 key, you can use them in addition to other shortcuts. A picture is worth a thousand words, so check out these images as you read about each feature. This figure shows a typical jumble of windows from a variety of applications strewn all over the screen. Myriad open windows from numerous apps obscure one another. To see Mission Control, which displays all open windows in all open applications, as shown here, press Control+up arrow. After invoking Mission Control (Control+up arrow). 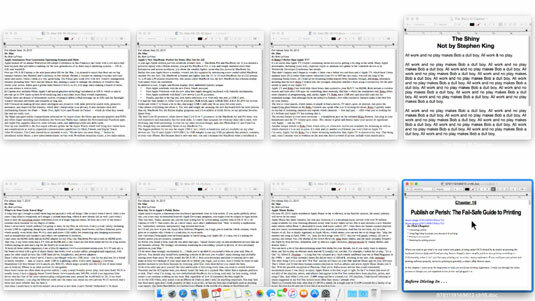 To see all open windows belonging to the current application (TextEdit here), press Control+down arrow. 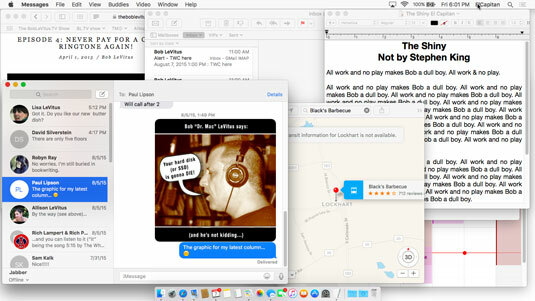 After invoking Application Windows (Control+down arrow) when TextEdit was active. If you hover your cursor over a window on a Mission Control screen, a blue border appears around the item you’re hovering over (a TextEdit document in the figure). If you then press the spacebar, you’ll see a preview of the window’s contents, which is especially helpful when a window is partially obscured by another window. To hide all open windows and display the Desktop, press F11 or Fn+F11. To summon forth the Dashboard (which displays your widgets), press F12 (or Fn+F12). Or, if your F4 key has a Dashboard icon printed on it, press F4. Notice that when you’re using Mission Control, windows appear as reduced-size thumbnails. Identifying information — either the program or window name — appears below the mini-window, making it easier to discern what each item contains. When you click any of these small windows, Mission Control deactivates, and the window you clicked becomes the active window. One last thing: If you use a trackpad, check out the More Gestures tab in the Trackpad System Preferences pane, where you can enable a three- or four-fingered swipe upwards to invoke Mission Control.